The advanced design offers 360 degree ports which steadies the muzzle so you can watch your hits and get back on target fast during rapid fire. I was worried about this part because of the other reviews. But I did not have the same problems with the threads. The brake that I received threads into the barrel perfectly. There is no gap left. It looks as though they are one piece. The matte black is the perfect match for my matte barrel too. The only reason I'm giving it 4 stars is because I haven't had a chance to shoot any rounds through it yet. I'm not sure if it will affect accuracy or not yet. Have only put about fifty rounds thru it but seems solid. 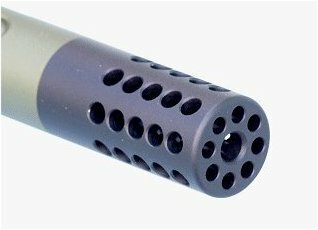 .920 fluted accuracy barrel and adtac stock marry well together. Smooth quite shots with little to no recoil. The break is well made, works well, and looks great. The only reason it did not get 5 stars is that the threads are a little short so much that with a crush washer on it still does not thread far enough.